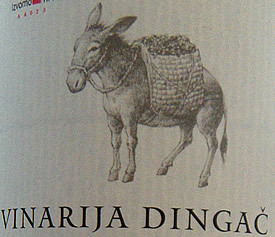 I’ve just been reading a great book on Plavac Mali, the quintessential Dalmatian red wine. Very readable, and how nice to find such a good source of information written in English! I was particularly interested to read the history, and amazed at how far back it goes. Plavac Mali comes out of a cross between two grape varieties, namely Zinfandel and Dobričić. Actually Zinfandel isn’t the local name. That’s what it was called on its arrival in the New World. On Hvar it was better known as Tribidrag, around Omiš it’s Pribidrag, in the Kaštel area west of Split it’s called Crljenak kaštelanski, and in southern Italy it’s Primitivo. They can now tell that these grapes are all the same variety, isn’t DNA wonderful! Anyway, after being a staple of Dalmatian wine production from around the 15th century (and for all we know, earlier than that), Tribidrag all but disappeared from local vineyards, to be replaced by the new, improved youngster – Plavac Mali! Plavac Mali first gets an official mention in the 1821 publication on Viticulture of the Austrian Empire. A little later, as “Plavaz Piccola“, it was included as a varietal in an experimental vineyard near Vienna. I imagine it probably didn’t do too well that far north, as it really flourishes on the sunny slopes of its native Dalmatia. Apparently the oldest known vineyard of Plavac Mali is in Dol, on the island of Hvar. There are actually still 20 vines originally planted in 1860 by Mate Stančić. These are self-rooted, since the soil is sandy enough to stop the dreaded phylloxera bugs. So many vines died off in the early 1900s, that this small remnant of 150 year old plants is quite a rarity. Plavac=blue and Mali=small, so the Croatians are really calling these grapes “Small Blue“. The blue refers to the lovely deep skin colour of the grapes, while small refers to the size of the bunches. Funny how a small blue makes such a great red! 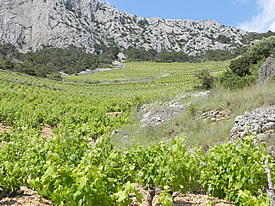 The best growing areas for Plavac Mali are south or SW facing slopes down to the sea. They need to be protected from the cold winter winds off the continent, and they benefit from the extra reflection of sunshine off the water. So, where are we talking about for the absolute best Plavac Mali wines? That would be the southern slopes of Hvar (Sveta Nedelja, Ivan Dolac), and the Pelješac peninsula (Dingač, Postup). And now I know why they call those vineyards the south beaches! We also talk about the grape a good deal as well as all the wineries that are producing it these days in our Dalmatia Guide. Glad to have found your blog. Will have to keep up. Thank you for the excellent post about our little blue friend, Plavac Mali. For any readers who are interested, the Plavac Mali book you mentioned is available for purchase from Wines of Croatia in New York. Please email info AT winesofcroatia DOT com for more info.